Sometimes, when I sit still in the garden for just a minute, the old woman at the door comes and pays me a visit. Long-time readers, you remember the old woman at the door, don't you? She seems quite familiar to me, and when I look her in the eyes, I sometimes see my own reflection. She keeps me on the straight and narrow and reminds me what gardening is all about. Sometimes, she reminds me that it isn't all about gardening. Occasionally she insists I hire help with some of the more arduous tasks of gardening, like spreading mulch or cutting off great big tree limbs. I remind her it is hard for me to fathom that the trees I planted are big enough now that I should ask for help when cutting off lower branches. She smiles and nods at me. She knows. She gets me, as they say. She seems to have traveled all the same roads I've traveled, hoed the same rows, but she is further ahead of me, always. She looks back to see me. I'm sure she sees me more clearly than I see her off in the distance. The other day, the old woman at the door and I were sitting quietly in the garden when she asked me about the new app on my iPhone called The Amazing Type-writer. I explained how it is set up to be like a typewriter, so much so that you can't backspace and delete a letter you didn't mean to type. 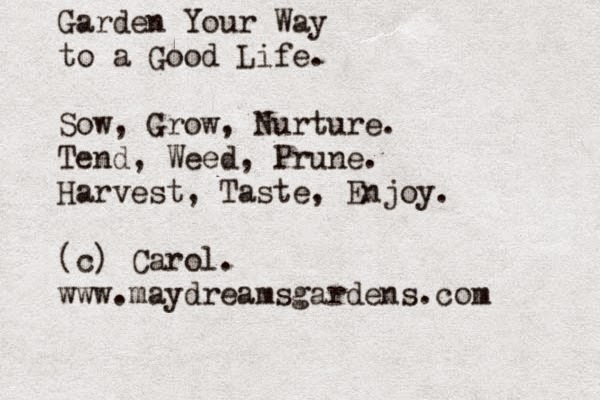 She and I talked more about gardening and came up with nine words of advice on "Garden Your Way to a Good Life" and I carefully, slowly, typed them via my "typewriter", to come up with a nice card with the nine words. It's all about balance, she said. Sometimes you have to create and coddle - like when you sow, grow, and nurture. There is also a time to take care of what you have and even get rid of what isn't adding value - tend, weed, prune. But always you must find time to reap the fruits of your labor - harvest, taste, enjoy. She told me if I had all three of those, I had balance. I'm working on that balance. I suppose a little more weeding is needed and after that some enjoyment is in order. I promised the old woman I'd keep these nine words close at hand and commit them to memory. She seemed satisfied that I would try, and got up and walked away, disappearing through the garden gate, leaving me to sit and ponder some more. Words of wisdom. Words to live by. Loved this! Enjoyed your 'self' reflection. Totally agree with the old lady Carol. I know her, sometimes she talks to me too. I need these etched on a plaque and hung in my garden to remind me! Life is all about balance isn't it? You are so lucky to have people stopping by with such words of wisdom. And we are lucky that you pass them on.